Marble mosaic wall tiles come in sheets for easy installation, and they can be used in an incredible array of projects. While you may know that they’re a great choice for the kitchen backsplash, they can actually be used throughout the home. When you’re working on a home improvement project and want a unique look, this unique finish is sure to please you. Here are just a few of the unique ways that you can bring marble mosaic finishes into your home. One of the appealing benefits of marble mosaic tiles is that it helps add texture to any finished area. If you have a large wall that might benefit from decorative painting finishes, consider covering it with marble mosaic tiles instead. This is an excellent option for large elegant foyers where the expanse of one plain wall might overwhelm the space. It’s also an attractive choice as an accent wall in the living room, and it will make any mud room more attractive and impressive. While mosaic tiles typically come in a square format, you can also go with tumbled mosaic tiles for a different look and a more random texture. When you go with hard flooring surfaces in the home, you may be at a loss for finishing off the stairs. While it’s easy enough to add the flooring material to your stair treads, you’ll want something a little more durable than simple paint on the risers. This area will take regular abuse as people go up the stairs and accidentally kick this vertical surface. You can add texture, color, and durability to this area by covering the simple wood structure with impressive marble mosaic tiles. You’ll take any stairwell from simple to impressive, and you’ll make it easier to keep the risers clean and looking impressive. You can find medallions that are perfect for the space over your stove, the blank wall at the end of your shower, or the space above a fountain on the patio. These are all high-traffic, high-moisture areas where other art mediums would easily be damaged, but marble isn’t harmed by heat or moisture. Install the medallion and then fill in the area around it with marble mosaics. You can then finish off the entire piece with a lovely border that clearly defines the artwork and makes a smooth transition to the wall beyond. Combine different colors to make your own artistic centerpiece and you’ll create a stunning focal point that’s sure to please you for years to come. Mosaic tiles are commonly used as borders because they’re easy to work with, affordable, and sure to make a great impression. Use them to create a visual line around your shower, or top off wainscoting in the kitchen with a narrow strip of mosaic tiles. The mesh netting that holds the tiles together is easy to cut apart, so you can decide how wide or narrow the border will be. Use the tiles to highlight a mirror or finish off the window frame in a bathroom or kitchen. The tiles can be used in exterior applications, as well. You can also use mosaics as the backsplash in an outdoor kitchen, the cove molding in your pool, or to create walkways and patterns in your pool deck. If you’re having a custom pool built, then consider mixing mosaic marble tiles with the concrete lining of your pool to create intricate patterns that will be visible through the water. People sometimes shy away from marble mosaics because they’re concerned about the labor and time involved with laying and grouting around thousands of little tiles. However, the mesh backing takes the stress out of installing mosaic tiles. They go into position as quickly as one-foot-square tiles, and they’re actually easier to cut and work with. When it’s time to grout, you’ll simply float the grout over the entire surface. While it will take a little longer to handle the grouting, it’s well worth the additional labor. The small tiles are ideally suited to smaller rooms where you want to visually enlarge the space, and they can also be used to create borders or patterns within a field of larger tiles. When it comes to small vertical areas, such as bathtub aprons and baseboards, people often reach for wood or even plastic. If you’re installing marble on the floor near these areas, then mosaic tiles are an excellent choice for the vertical surfaces. If the color closely matches what’s on the floor, then you’ll make the space look larger. You can also make the baseboard stand out slightly by going with a contrasting shade. If you decide to go with mosaic tiles on the bathtub apron, balance the textured area out by adding mosaic tiles as a border around the tub. Marble and ceramic tiles have long been used on furniture, and you can use mosaic marble tiles to give an old table a fresh, attractive look. Once you inspect the table to be sure that it’s structurally sound and can handle the weight of the marble, use a sander to gently remove the outer layer of varnish from the top of the table. Install the marble mosaic tiles as one solid color, or mix colors to make your own custom artwork. Carry the tile right to the edges, or finish the edges with special wood trim made to cover a 90-degree angle. You’ll be left with an impressive piece of furniture that’s sure to become a centerpiece. Another use for marble mosaics tiles is small, portable kitchen accents. Put little pegs on the bottom of a wood board and then finish it off with marble for a trivet that will look great on any table. You can also use this type of portable tray to hold bottles of perfume in the bathroom or to sit under the vase on your coffee table. 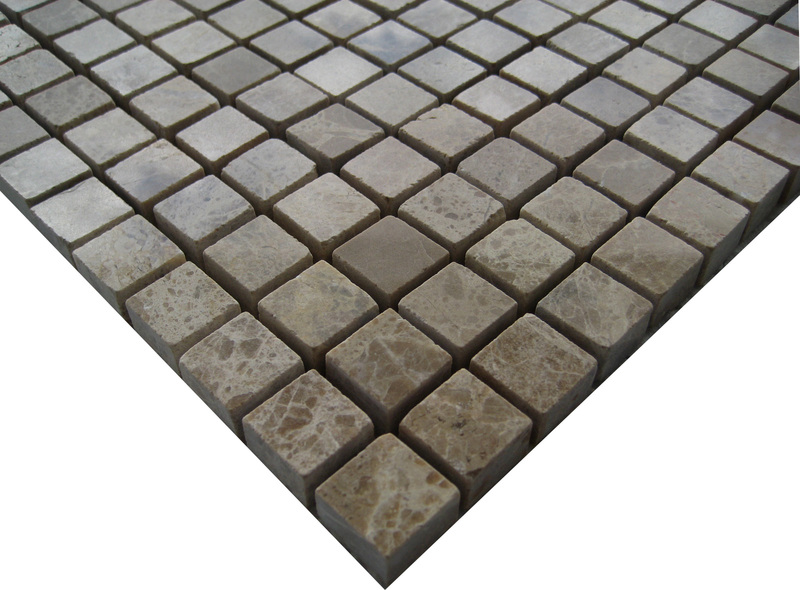 When it comes to marble mosaic tiles, the options are truly limitless. You can use them throughout your home to add color and texture to almost any area. They can handle being installed outside, and that makes it a perfect choice for your outdoor living area as well as your master bathroom. When choosing a supplier for your marble mosaic tiles, look for a company that will provide you with high-quality tiles at wholesale prices. Nalboor is committed to customer satisfaction, so we offer great customer service along with impressive prices. Our customer service professionals are happy to answer any questions you have, and we’ll help you place an order for your marble mosaic tiles and other pieces. Give us a call today to discuss your plans and see how marble mosaic tiles can enhance and improve your home.